MEXICO – Students in the Culinary Arts program at the Center for Instruction, Technology and Innovation recently learned what it takes to cook in the military thanks to a visit from the U.S. Army. 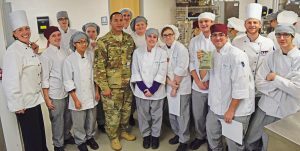 U.S. Army Sergeant Jonathan Gomez recently met with the Culinary Arts program at CiTi to discuss potential military careers opportunities. Pictured, Gomez shares Meal-Ready-to-Eat packets with the class. Sergeant Jonathan Gomez of the U.S. Army recently visited the program to participate in a taste testing exercise using Meal, Ready-to-Eat (MRE) packets. MRE packets are self-containing, lightweight and easy-to-make food rations utilized by military personnel where other food facilities are not readily available. The taste testing exercise showcased the limited food options soldiers have and also demonstrated the skillsets needed to be a food service specialist in the Army.